Circulators are electrically powered pumps used for circulating water in heating, air conditioning, and domestic hot water systems. As part of our commitment to uncompromising quality and to installing the most energy efficient heating and cooling systems possible, TJ’s includes circulator pumps with ECM motors on all of its new boiler installations and boiler replacements. ECM stands for Electronically Commutated Motor. Basically, circulator pumps with ECM motors offer intelligent speed control. 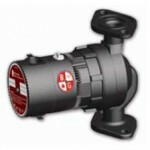 Speed-controlled pumps automatically adjust their output to changing demand, whether it be due to outside temperature, level of sunlight, overall activity, and other heating sources. The benefit of having a more efficient ECM motor pump is substantial energy savings, which directly relates to cost savings. 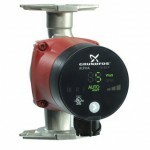 Grundfos ALPHA2 circulator awarded “Best energy-efficient circulator” by EU project, “Energy+ Pumps”. The ALPHA2 from Grundfos adapts to the variable demand of the house while keeping your comfort. In that way it saves a considerable amount of electricity and thereby reduces an equally large amount of CO₂ emissions. Rated A for its energy efficiency, the ALPHA2 is a highly reliable and environmentally responsible choice. When installed and set in the unique Grundfos AUTOADAPT function ALPHA2 will analyze and adjust automatically to your heating demands. Meaning you can sit back and relax and literally save money and energy without loosing your comfort. 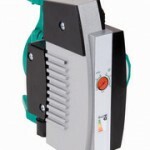 The Wilo Stratus ECO circulator pump is a seal-less circulating pump with flanged connection, electronically commutated motor and automatic performance adaptation. It is used in residential closed loop hot water heating systems, water and water/glycol solutions up to 50% concentration (cast iron version) and domestic hot water recirculation systems (bronze version). Run dry protection prevents motor burnout.